Note from Nancy: These two Awesome Moms have different stories. One went with her instinct and one went with bad advice from others. In the 1850s Dr Emit Holt started teaching moms to not hold babies and to feed on a schedule. Dr Watson, head of the American Psychological Association at that time followed with more encouragement of the same. The US government then actually took up the cause and printed pamphlets to instruct mothers in how to properly destroy their attachment with their babies while damaging their brain development (our tax dollars at work ) The Essos took up the torch with Baby Wise and now Dr Ferber has put a catchy title on it called Ferberizing! Well here come the Brits to the rescue with some great research in our final paragraphs! Once we became parents everyone advised us how to be good ones. My father in-law was one of many well-meaning people who told me to let our “baby cry it out.” He said I would spoil him if I picked our son up all the time. Several friends and neighbors counseled me in how to “Ferberize” our son when he was having trouble sleeping. Others were surprised that I carried him everywhere, or had him in a sling, even after he could walk. Although it was tiring at times to be so attentive to our son, we have come to understand how important that investment of time and energy was. While our child is naturally strong-willed our efforts have been rewarded with a well-adjusted boy. We have watched our child develop at an accelerated rate compared to other children. He has a capacity for compassion that we began to notice as a toddler. While playing with other children if one cried he would go to comfort them. When it came time to potty train our son we were in-tune enough with each other that I could usually tell when he needed to use the restroom. He was completely potty-trained during the day before the age of two. And more than anything else we have seen a confidence in himself and his place in our family. We attribute this success to the trust that was built by answering his needs as a baby and young child. Now that our little boy is four we can see the difference between how he has developed as compared to his friends who were left to cry it out. Our son still tests and tries to assert his independence, but he is not out of control and aggressive. After he has been obstinate or disobedient, as all children will be from time to time, he tries to make amends and sincerely wants to please us. He is able to spend time with friends and spend time apart from us, but is happy to see us when we return. We see that we have a reciprocal bond with him. I can also share that we have experienced the repercussions of not meeting the needs of a young child. We adopted two children after the birth of our first son. Our oldest son and daughter did not have their needs met, and both had extreme behaviors from RAD Reactive Attachment Disorder. Our family has learned through our parenting experiences how important the first three years of life are. We have come to understand that when a child feels like they cannot depend on their parents a meaningful relationship with them is impossible. After having my first child and going through the stress of a colicky baby I was looking for different answers to make things better. After about 8 months I was very sleep deprived and desperate. I went to my local library looking for resources and found a book describing a method called “Ferberizing” named after the founder Dr. Richard Ferber. His idea is that around 6 months you lay your baby down for bed and let them cry it out the theory is that eventually babies learn to soothe themselves. When reading it, it seemed to make complete sense and on paper it seemed ideal, because of my selfishness. I ended up sticking with it and yes my baby did go to sleep on his own, but at a high price. I jeopardized our bonding relationship and bought into the idea that we need to make our children to become independent. My son is now 5. He struggles! Looking back on this I regret making this decision and sticking with it! Mothers are meant to soothe their crying babies. That is what this relationship was designed for. Instead of letting him cry I should have been soothing him holding him close to me, rocking him to sleep. Yes this takes sacrifice and endurance but the long term rewards are well worth it. Our second son was adopted as an infant and I was much more knowledgeable about bonding and kept him in a kangaroo type pouch for the first 9 months of his life and the rewards are well worth the time. I encourage anyone who is reading this to rethink any of their ideas about “ferberizing” their babies. I encourage you to also educate other mothers not to partake in such methods, but rather to encourage them to look into the importance of bonding. 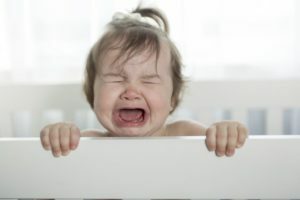 Distressed babies who are left to cry are at a greater risk of developing problems later in life a child care expert said. 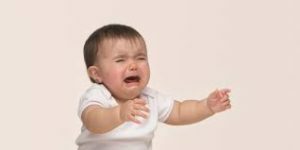 “Long periods of crying can damage developing brains leading to learning difficulties later in life.” said Dr. Penelope Leach. “ It is not an opinion but a fact that it’s potentially damaging to leave babies to cry.” she said. Dr. Leach, who’s an honorary research fellow at the Tavistock Clinic, says recent scientific research backs her up. Saliva swabs, for instance, have shown increased levels of cortisol in distressed babies whose cries have not been responded to. Neurobiologists say cortisol could be toxic to infant brains.